Looks smart, will suit most kitchens, and performs well. The labels on the front may not be that durable. The Sharp R658KM is a mid priced microwave, aimed at medium sized households, with a total capacity of 20 litres, 800w of power and a grill built in. Featuring an all black exterior, the inside is constructed from stainless steel, and so is easy to clean. The 6 different power levels provide ample cooking options, and the 1000w grill performs well, heating up fast and leaving a nice crisp finish to foods. The touch controls are well labelled, and are easy to use - we did not have any issues with this aspect of the microwave - however we have heard reports that the labeling isn't the toughest, and so may fade with repeated use. Overall turntable size is 27cm, and the weight is a fairly light 12.5kg. The sequencing programming facility is handy - enabling you to set a phase of microwave and then grilling, or vice versa, saving you from having to return to the microwave once you've started the sequence. Upon completion the microwave has a bleeping system to announcing it's completed it's cycle - and then repeats this alarm every few minutes. 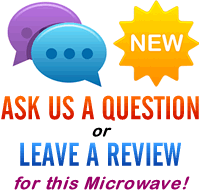 Overall it's a smart looking black grill microwave offering decent performance. 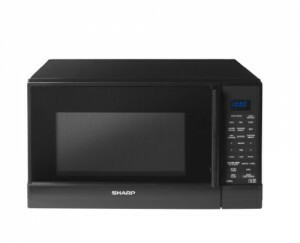 A decent microwave from Sharp - very well constructed, looks good, easy to maintain, and performs admirably.